THE BLACK STILETTO: BLACK & WHITE (Book #2) will be published in Germany by Luzifer-Verlag in e-book by year's end, and in print in January 2018. Once again! THE BLACK STILETTO: THE COMPLETE SAGA e-book (5 books in 1!) is on sale for $2.99 on Amazon Kindle & KOBO thru July 17! The five individual titles are only 99 cents each. Sandra Brown says about The Black Stiletto: "...one of the most original heroines I've read in a long time." Here's the Amazon link. #BookBub is at it again! For ten days only, March 15 through March 25, 2017, THE BLACK STILETTO: THE COMPLETE SAGA e-book is on sale for only 99 cents. That's all five books in the serial contained in one e-book! It's available for Kindle, Nook, and other e-book formats. Here is the link for Amazon Kindle. Lee Child says, "If the Black Stiletto series is under your radar, there's something wrong with your radar. This is a five-book sequence of the highest quality, full of thrills and suspense, and fun and humanity, too." 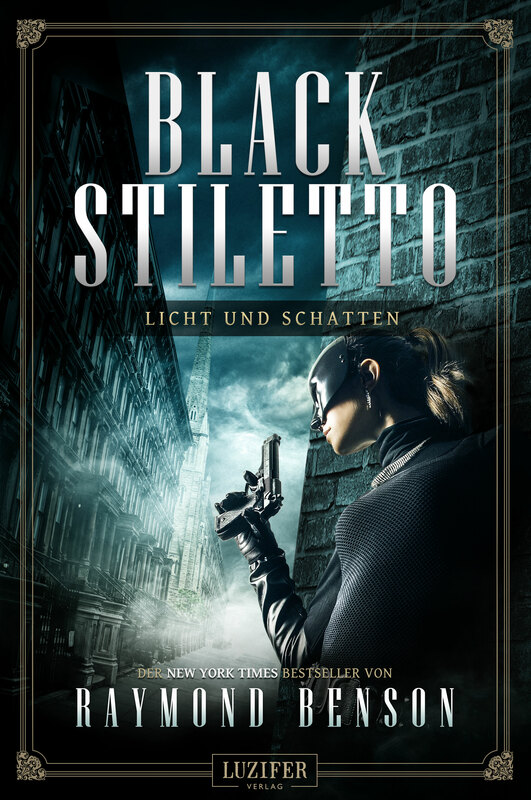 The German edition of THE BLACK STILETTO, published by Luzifer-Verlag, is now available in paperback and e-book! Here's the Amazon Germany link. The book trailer for the German edition of THE BLACK STILETTO is online! You can view it here. The book will be published on October 31 by Luzifer-Verlag. The German edition of THE BLACK STILETTO will be published on October 31 by Luzifer-Verlag! THE BLACK STILETTO: THE COMPLETE SAGA e-book collection made the New York Times E-Book Best-Seller List at #15! THE BLACK STILETTO: ENDINGS & BEGINNINGS received an "Honorable Mention" for Best Traditionally-Published Fiction of 2014, Chicago Writers Association Awards! Now available as an e-book! THE BLACK STILETTO: THE COMPLETE SAGA. All five novels in one bundle. You can get it on Amazon here. THE BLACK STILETTO: SECRETS & LIES won the Lovey Award for Best Suspense Novel of 2014 at the Love is Murder Writers Conference! THE BLACK STILETTO: ENDINGS & BEGINNINGS won "Best Book Serial of 2014" from AUTHORS ON THE AIR GLOBAL RADIO NETWORK! Raymond is interviewed by Omnimystery News about The Black Stiletto and his writing process. THE BLACK STILETTO: ENDINGS & BEGINNINGS! The FIFTH and FINAL installment of The Black Stiletto saga. Officially pub date is tomorrow (Tuesday, February 4), but you can get the Kindle e-book at the sale price of $2.99 now, plus all FOUR other Black Stiletto titles are also $2.99 each this week! Everything will be revealed. All questions will be answered. It's 1962. Judy Cooper's nemesis and his psychotic sister have set out to ruin the very pregnant Stiletto, forcing her to flee to Texas for a showdown with destiny. In the present, the Alzheimer's that afflicts elderly Judy is in its last stage, but her son and granddaughter must continue to protect her from the past's last remaining threat. Lee Child says, "If the Black Stiletto series is under your radar, there's something wrong with your radar. This is a five-book sequence of the highest quality, full of thrills and suspense, and fun and humanity too." An interview with Raymond on THE BLACK STILETTO series and its conclusion appears in International Thriller Writers' monthly newsletter The Big Thrill! Looking for signed first editions of Black Stiletto books? Visit Signed First Editions - VJ Books! THE BLACK STILETTO comes to Italy! Cento Autori will publish the first book in Italian on March 21. THE BLACK STILETTO: STARS & STRIPES won the "Lovey" Award* for Best Suspense Novel of 2013! TODAY is publication day of THE BLACK STILETTO: SECRETS & LIES, from Oceanview Publishing. This is the fourth novel in the five-book saga (number five will be published in November 2014). Booklist has praised it, saying, "This fourth entry in the Black Stiletto series is darker than earlier ones, given the escalating violence in both past and present story lines. But it's no less entertaining, as fast-paced action leads to a cliff-hanger; closure is likely in the next entry, and there's potential for a spin-off. Addictive escapism." The book is available in hardcover and e-book, with audiobook coming soon. Here's an interview/article about THE BLACK STILETTO: SECRETS & LIES in The Big Thrill, the newsletter of International Thriller Writers. Here's an interview about The Black Stiletto at the Eerie Digest/Arts and Entertainment Magazine, edited by Joseph J. O'Donnell. April 2, 2013 is publication day for THE BLACK STILETTO: STARS & STRIPES! It's available in hardcover and e-book. Audiobook to come. You can order it on the Order page. A new trailer video has been produced for the book, and it can be viewed here. A wonderful article, "Moms with Stilettos," about the Black Stiletto in Colliers Magazine. Look what's on the cover of HOLLYWOOD WEEKLY MAGAZINE this week! A very good and revealing interview about the Black Stiletto and more is at RedEye Chicago. THE BLACK STILETTO is now a unique AUDIOBOOK with three narrators, at Audible. THE BLACK STILETTO: BLACK & WHITE is published today! It's on sale for limited time at Amazon (Kindle $2.99!, Hardcover $17.45!)! Or save 40% if you buy directly from Oceanview Publishing and use Code Stiletto at checkout! THE BLACK STILETTO e-book reached the Amazon Kindle Store's Top Ten (#7!) recently. Things are gearing up for the publication of the sequel, THE BLACK STILETTO: BLACK & WHITE (May 30). Watch this space and Raymond's Facebook author page for updates, contest announcements, price drops, reviews, and other Black Stiletto news. Check out the very nice interview with Raymond and the review of THE BLACK STILETTO: BLACK & WHITE on "The Big Thrill" e-newsletter from the International Thriller Writers: here! 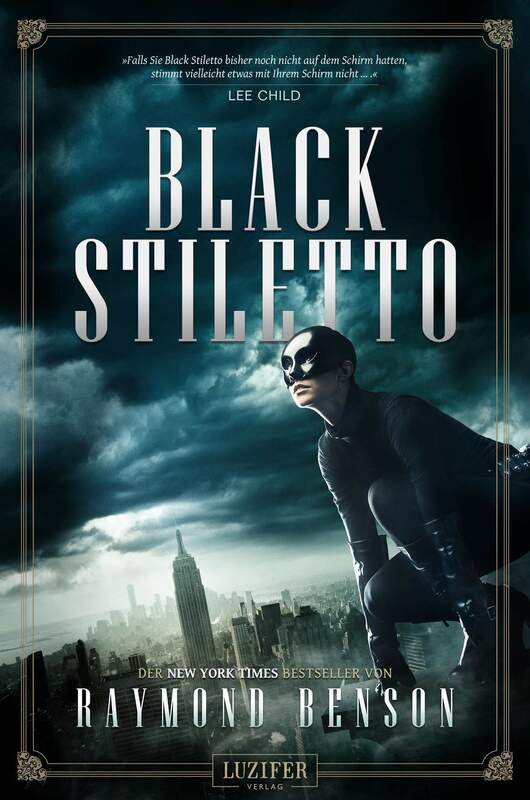 The film rights to THE BLACK STILETTO have been picked up by Lonetree Entertainment. Benson was represented by veteran literary and film manager, Peter Miller, of Global Lion Intellectual Property Management, Inc.
"Stiletto was a real find and we're all very excited about the potential of this unique genre-bending project," said Lonetree producing partner Tony Eldridge. Lonetree Entertainment is currently partnered with Escape Artists and Sony Pictures on "The Equalizer" feature film starring Denzel Washington. The company has a number of other projects in development, including the epic WWII action drama, "The War Magician" with Marc Forster attached to direct, and "The Kitchen House", based on Kathleen Grissom's New York Times bestseller. Lonetree is fast tracking Stiletto and is currently in discussions with several A-list screenwriters. In other news, THE BLACK STILETTO: BLACK & WHITE (#2 in the series, publication date May 30, 2012) has received its first review from Bestsellersworld.com! Pierre Rodiac has translated the short story THE BLACK STILETTO'S AUTOGRAPH in French. It can be downloaded for free (J'ai eu l'autorisation de l'auteur de traduire en francais la nouvelle L'autographe du poignard Noir, telechargeable ici) here! Raymond Benson is interviewed by Brad Hansen on THE BLACK STILETTO here. For a limited time only, THE BLACK STILETTO is on sale for $4.99 for Amazon Kindle! Get it now! Kindle Sale! Raymond Benson guest blogs on Janice Gable Bashman's "The Writing Life," talking about locations in THE BLACK STILETTO and how he uses settings in his thrillers. The blog is here. THE BLACK STILETTO is shipping! Official publication date is September 5, but Amazon is already fulfilling orders and the book is trickling into retail markets. If your local bookseller doesn't have it, please ask that it be ordered. Or you can buy it right here on the Order page. The e-book editions should be available (Amazon Kindle, B&N Nook, etc.) on the publication date or a couple of days later, so keep checking the websites. Great reviews are pouring in...check out the Praise page for samples and links to full reviews. More will be added as they come in. Author Raymond Benson is making many personal appearances to promote the book. Check out the Appearances page of his official website for dates, locations, and times. Customers will receive a free limited edition of Will Arrington's "Black Stiletto Song" CD single! International Thriller Writers' ezine "The Big Thrill" interviews Raymond Benson for THE BLACK STILETTO here. On the next edition of "Dave White Presents," author Raymond Benson talks about THE BLACK STILETTO. The online radio debut will occur Tuesday, August 30, at 7:30 p.m. EST, then 7:30 Pacific over at KSAV. On Wednesday, August 31, the show will become available as a podcast, mp3 download or on the player here. It will also be available from itunes and through TEVO. Two songs by WILL ARRINGTON have been added to the site on certain pages—THE BLACK STILETTO SONG (with vocals) and an instrumental version, THE BLACK STILETTO STALKS THE NIGHT. THE BLACK STILETTO has received a *starred* review from BOOKLIST, which calls it "prime escapism"! Check out the impromptu interview with author Raymond Benson at ThrillerFest 2011 by blogger/reviewer Susan Tunis and find out more about The Black Stiletto here. The Odessa American newspaper (in Texas) published this article about THE BLACK STILETTO, since some of the novel takes place there: Odessa American Article. In anticipation of the publication of THE BLACK STILETTO in September, a FREE Black Stiletto short story has been made available. —over at Smashwords.com and choose the format you want. A profile of THE BLACK STILETTO and Raymond Benson appeared in Chicagoland's Pioneer Press newspaper here. Check out this write-up at New Book Journal for a little more info about the book! The Black Stiletto Official Website has launched! The Black Stiletto has joined Facebook—please go to her official fan page and LIKE it here! Watch this space for more news as it comes!